The Catholic Charities Appeal continues to be the principal fundraiser for social outreach in the Archdiocese of Philadelphia, but this year it may also help other ministries of the local church and its parishes. 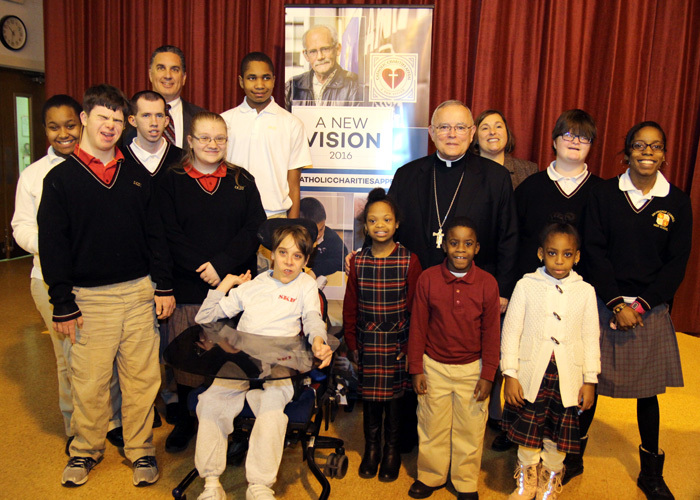 Archbishop Charles Chaput kicked off the start of the 2016 annual fund drive Jan. 28 at St. Katherine Day School in Wynnewood, one of four schools of special education run by the archdiocese and a recipient of appeal funds. 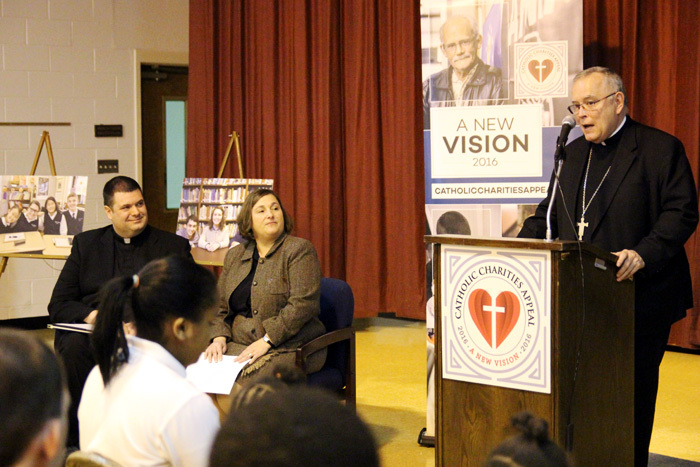 The appeal’s theme this year is “A New Vision,” and the archbishop announced a new goal of $15 million for the appeal, a 50 percent increase from $10 million in recent previous years. He explained that the first $10 million raised will continue to go toward serving the poor of the region, an activity he identified as being essential to Christian life. Any amount over that, anticipated to be an additional $5 million, will fund other ministries in the archdiocese and parishes. It is also a recognition that archdiocesan belt tightening over the past four years has put limits on the services and outreach the archdiocese is able to provide in the region, and makes the case for new donations from the Catholic faithful. 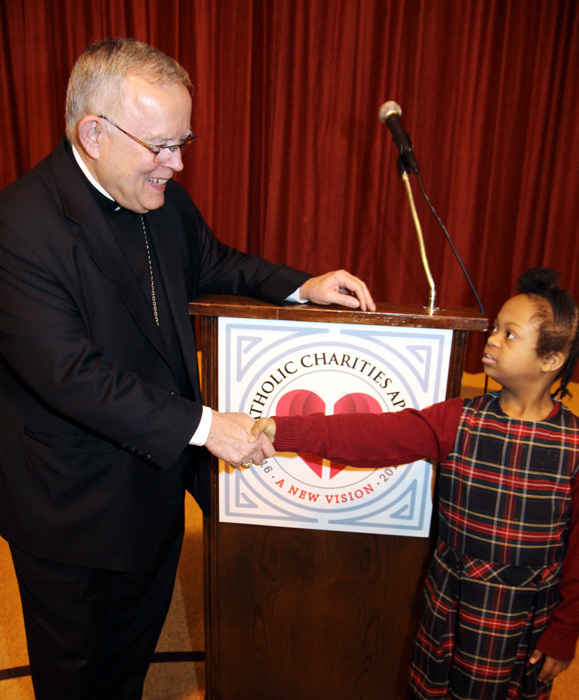 When Archbishop Chaput came to Philadelphia in 2011, the archdiocese was carrying a $17 million operating deficit. By last year that had been reduced to a $700,000 deficit, but it stubbornly remains red ink and prohibits the archdiocese from offering evangelization and other programs or growing staff and resources to church offices. “We can’t continue to operate at (that) annual deficit for very long,” Archbishop Chaput said. As the cost of living rises for households, so it also rises for the archdiocese. At least one of those costs, for example, is rising quickly: a new influx of seminarians studying for the priesthood is good news for the archdiocese, but a new financial burden because the archdiocese pays much of a seminarian’s tuition. More seminarians, along with programs to boost cultural ministries, pro-life and family initiatives, communications, outreach to college students, parish support and other diocesan functions all cost money. Paying for them previously relied mainly on revenues from parish assessments, but with a fraction of people today attending church on a regular basis, a fraction of the revenue must support vital ministries, all of which leads to a deficit. The hope is that money gathered from a diocese-wide collection as part of the Catholic Charities Appeal could eliminate ongoing deficits and help grow the church’s support ministries. The appeal altogether will serve more than 200,000 people in the region regardless of religion or background. Nearly 180 agencies, programs and offices across five categories are beneficiaries: four schools of special education; dozens of Catholic Social Services agencies and Nutritional Development Services; needs of retired clergy and seminarians; a group of 16 “mission parishes” in need of assistance in disadvantaged areas; and support of evangelization, parish and spiritual life throughout the archdiocese. He said he personally is hesitant to ask people for money. But the practice of donating generously to the church is rooted in the earliest Christian community, as the Acts of the Apostles records St. Paul seeking donations from the faithful to support the good works of the nascent church. The Catholic Charities Appeal will become more visible in coming days, according to organizers. By next weekend (Feb. 6-7) parishes will have brochures and other materials including a video and announcements to be read from the pulpit in support of the appeal, and speakers will be available to talk to parishioners at Masses. The greatest source of donations to the appeal comes from responses to its packet mailed to every registered household in the archdiocese, and those mailings go out this Friday, Jan. 29. Online donations can be made at the website CatholicCharitiesAppeal.org, where more information about the appeal is also available. All worthy endeavors especially the plans to use some of the excess funds for the new seminarians. This is a critical program for the Church’s future and the Church needs to continue to find better ways to institutionalize other like programs which are essential for solving critical internal Church problems and achieving the Church’s long term priorities. Right now one major problem is that the Church is dying on the vine because Catholics are leaving the Church and attendance at Mass is declining in direct proportion. Yes we should be feeding the poor but we must also be feeding the institutional Church or else there will be no Church left in the future to feed the poor. For example why don’t we have defined programs directed specifically towards growing the Church so it can better sustain its social justice giving programs, and more importantly, achieve its primary obligation which is to teach and lead souls to heaven? How about for starters funds to directly reach out to all the thousands of lapsed Catholics in the diocese to bring them back to the loving embrace of Holy Mother Church and then be able to advance the Church’s mission to save souls, and secondarily, to increase Church revenues for other essential programs? How about more relevant and impactful Mass sermons that can be shared with friends who never attend Church? Sermons that lovingly teach the beauty of the Catholic Church and challenge and motivate the congregation to personal holiness? By giving them a real reason to avoid sin and to let them know that the loving embrace of the Church will always be available to help them get up when they stumble? How about a sermon that provides practicing Catholics the reason why they should thank God that they are Catholics, and why they should be spreading the Good Word to everyone they care for and anyone else who is willing to listen and learn? That the Catholic Church is the only Church that was founded by God, that Catholicism is the One True Religion, and the only Certain pathway to heaven instead of hell? Do you think that would create a lot of spirited and worthwhile dialogue? I do so why not do it? It’s the truth, isn’t it? If the Catholic Church wants to bring back lapsed Catholics (and if it truly wants to reunify Christendom and convert the rest of the world) it needs to only do one thing. Differentiate itself by speaking the Truth and stop being ashamed. Then trust in God and let Him handle the rest!